Mutt Strut is even better with a team, so grab your coworkers, friends, and family and form a Mutt Strut team! If you wonder how you can make the biggest fundraising impact for the animals at IndyHumane, your best bet is a team. Teams come in all shapes and sizes, and are formed by Fortune 500 companies, small businesses, book clubs, church groups, neighborhood associations, and families! It’s easy to form a team, too, and it doesn’t come with any additional registration fees. Whoever is leading the team should create their team when they register, and then others can join the team as they join up for Mutt Strut. (Forgot to create your team when you registered? Email us for help!) 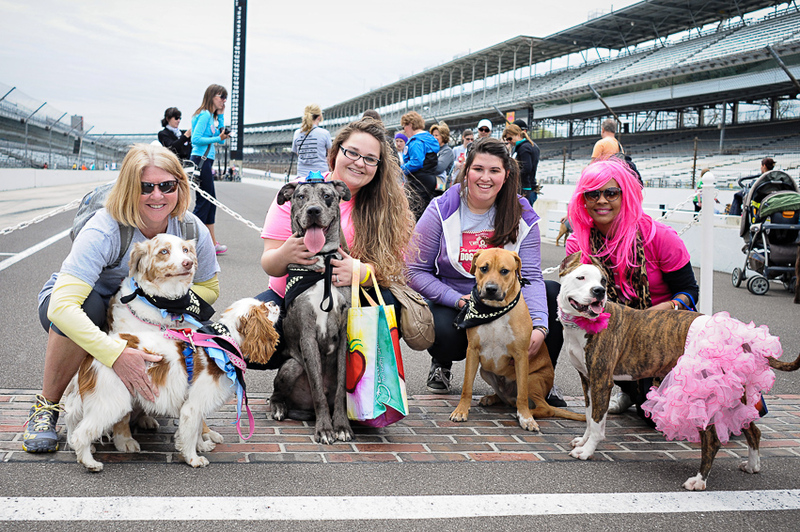 Your registration fees pool together and count toward your team’s fundraising goal, and your combined fundraising efforts lead to bigger benefits for IndyHumane! Not to mention, there are prizes for the top teams, and fun challenges along the way. Your Participant Center allows you to send recruitment and fundraising emails, so you can ask others to join your team right after you register, and you can add personalized messages for your team members. 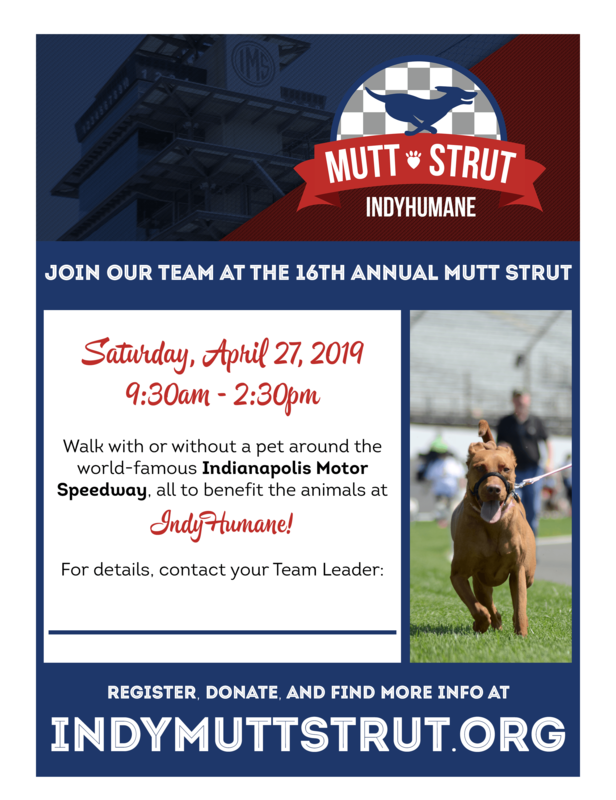 You can also share your team’s web address on Facebook, and encourage others to join with pre-designed, easy to use forms provided by IndyHumane. 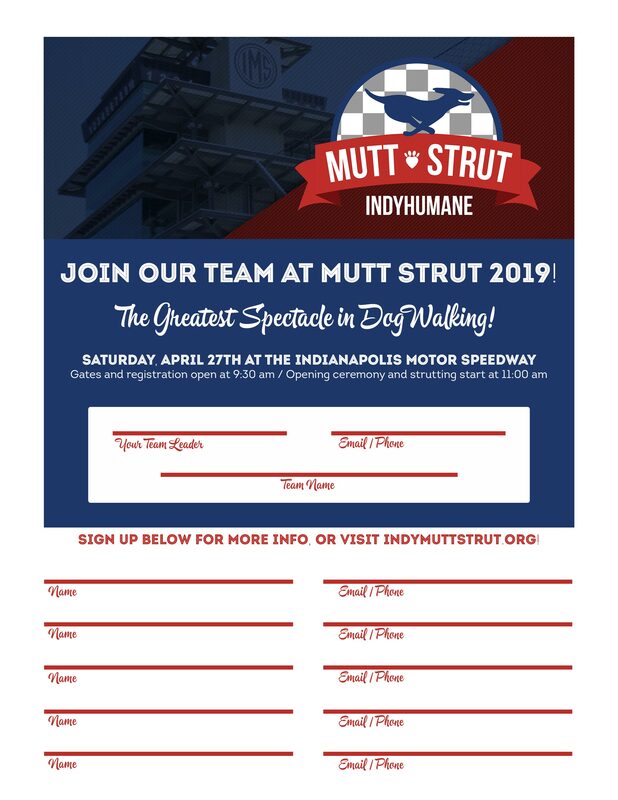 Plus, teams are invited to participate in contests and challenges during the lead up to Mutt Strut, and the team (top Corporate team, and top Community/Friends & Family team) that raises the most receives a special prize – 10 tickets to enjoy the Indianapolis Motor Speedway in the Mari Hulman Suite during Indy 500 practice (date TBD) as well as more fun prizes! Ready to get started? Click here to register! Want some help recruiting your friends, family, or coworkers? Download a team flier here and a sign-up sheet here! Part of the fun of being in a team are the team challenges! Check back soon to find out what challenges we have in store for Mutt Strut 2019.